Habit: Tree, shrub, with stipular spines at nodes or thorns in leaf axis (see leaf scars) or main leaf axis a strong spine. Stem: +- zigzag; bark smooth, green. Leaf: alternate or in clusters of 1--6 in spine axils, generally even-2-pinnate, sometimes appearing 1-pinnate, main axis flat, leaflets alternate, falling early or not; 1° leaflets 2--6; 2° leaflets 4--many. Inflorescence: raceme, axillary, generally < 7-flowered. Flower: +- bilateral; sepals +- free, alike, generally reflexed; petals +- equal, generally yellow or cream-white; stamens 10, yellow to orange, free, exserted. Fruit: indehiscent to partly late-dehiscent, generally flat, oblong, +- inflated, narrowed between seeds or not. Seed: 1--several. Species In Genus: 11--12 species, 2 named hybrids: America, southern United States to Argentina, Africa; cultivated. Etymology: (J. Parkinson, London, apothecary, author, 1567--1650) Note: Haston et al., Hawkins support treatment of Cercidium and Parkinsonia, both recognized in TJM (1993), as single, monophyletic genus. Unabridged Note: Since S. Watson (1870s), Cercidium and Parkinsonia have variously been treated as 1 or 2 genera; Carter 1974 and McClintock in TJM (1993) recognized both genera but work of Hawkins 1996 (Ph.D. Dissertation, Univ. Oxford, UK) and Haston et al. 2005 (Amer J Bot 92:1359--1371) support treatment as 1 monophyletic group. Habit: Tree generally < 8 m, with thorns in leaf axils; branches spreading, +- zigzagged, +- glabrous. Leaf: petioled, blue-green; 1° leaflets 1 pair, axis < 1 cm; 2° leaflets 2--6, 4--8 mm. Flower: corolla 2--2.5 cm, banner 9--15 mm, widely ovate, yellow, orange-dotted or not. 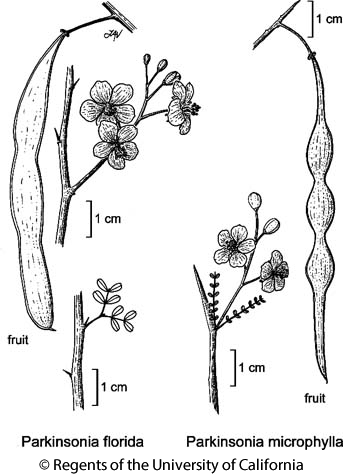 Fruit: indehiscent, 3--10 cm, flat, tan, +- not narrowed between seeds; tip beak-like. Ecology: Uncommon. Washes, floodplains; Elevation: +- 1100 m. Bioregional Distribution: D; Distribution Outside California: to Arizona, northwestern Mexico. Flowering Time: Apr--May (generally 2 weeks before Parkinsonia microphylla) Note: Subspecies not recognized by Hawkins (2006, pers. comm.). Unabridged Note: Subspecies of Carter 1974 (Cercidium floridum subsp. floridum, Cercidium floridum subsp. peninsulare) based mainly on overlapping, continuously varying characters that are not reliable; subsp. not recognized by Hawkins (2006, pers. comm.). Cult. Citation for this treatment: Martin F. Wojciechowski 2012, Parkinsonia florida, in Jepson Flora Project (eds.) Jepson eFlora, http://ucjeps.berkeley.edu/eflora/eflora_display.php?tid=36268, accessed on April 19, 2019.